FRESH SANDWICH PLATTERS & DELI ITEMS. 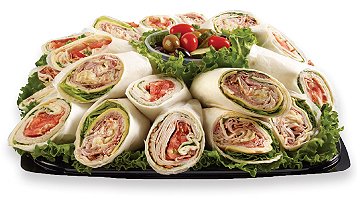 Mrs. B’s Sandwich Platters and Deli Items are great for parties, gatherings, business events, and so on. 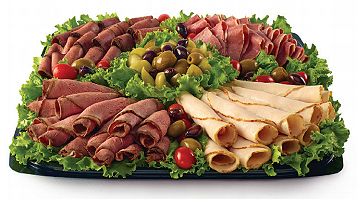 All deli platters are made from fresh ingredients, so that all platters will be crisp on the day of your event. Rosemary ham, sliced Brie cheese and Black Bear® Honey Mustard on a wholewheat Boulart® demi baguette. Mesquite turkey breast, smoked Gouda cheese, green leaf lettuce and Hellmann’s® Dijonnaise dressing on a baguette. Thinly sliced prosciutto di Parma, sliced Asiago cheese, roasted peppers, fresh basil, olive oil and balsamic vinegar on olive bread. Grilled zucchini, eggplant, roasted red peppers, fresh mozzarella and sun-dried tomatoes on a baguette. Roast beef, horseradish Cheddar cheese, stone-ground mustard and sun-dried tomatoes on seeded rye bread. Grilled lemon chicken, jalapeño Jack cheese, guacamole, green leaf lettuce and tomatoes on a baguette. Roast beef, turkey breast, ham, Swiss, lettuce and coleslaw. Turkey, bacon, avocado, lettuce, tomatoes and ranch dressing. Tarragon chicken salad, lettuce and tomatoes. Double-stacked—one layer of roast beef, turkey breast, pastrami or ham and Swiss cheese; a second layer with coleslaw and Black Bear® Sandwich Dressing. An assorted selection of panini featuring Black Bear® deli meats and cheeses. Includes Cuban, Caprese, Turkey Club and Steak 1 panini. 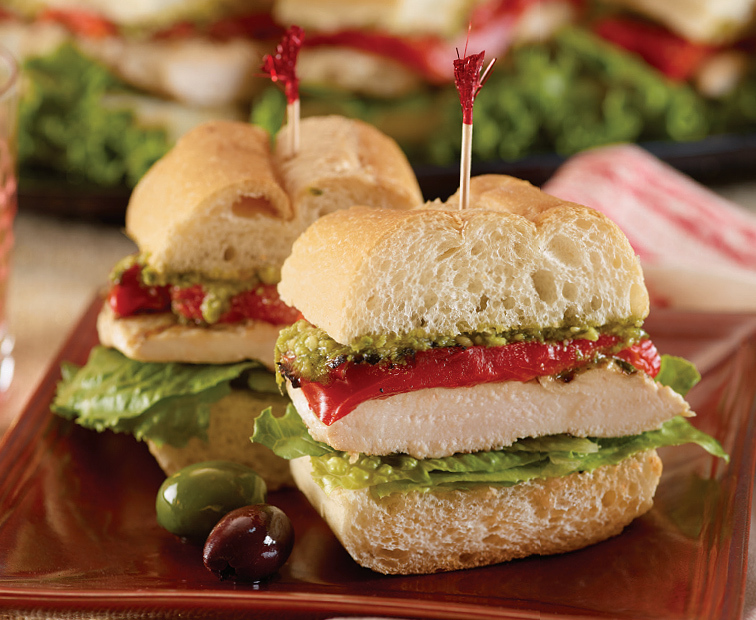 Lemon chicken, pesto, romaine lettuce and roasted red peppers on a sub roll. Choose from Italian, roast beef, turkey breast, ham and Swiss cheese, with shredded iceberg lettuce and tomatoes. Served with Black Bear® Hoagie Dressing. Thinly sliced tenderloin on Martin’s® Party Potato Rolls served with green leaf lettuce and Black Bear® Horseradish Sauce. Roast beef with sweet peppers; Virginia ham and Swiss with honey Dijon mustard; turkey with Alpine® Swiss cheese and Russian dressing. All made with green leaf lettuce. Assorted sandwiches made with ham and Swiss cheese, turkey breast with American cheese, and roast beef. Or shrimp, tuna and seafood salad. On Martin’s® Party Potato Rolls or croissants. 36 sandwiches made fresh with delicious Liscio Dinnrt Rolls. Choice of: roast beef, turkey breast, ham, chicken breast, tuna salad and American cheese. Choose from the hoagie selections below, available in 3-foot and 6-foot sizes. Domestic ham, sweet capicola, Genoa salami, provolone, shredded iceberg lettuce and tomatoes. Black Bear® Hoagie Dressing served on the side. Turkey, ham, Swiss & American, shredded iceberg lettuce, tomatoes and onions. Condiments served on the side. Grilled chicken, fresh mozzarella, pesto, sweet peppers and romaine lettuce. Roast beef, Virginia ham, turkey breast, Swiss cheese, shredded iceberg lettuce, tomatoes and onions. Condiments served on the side. Grilled zucchini, eggplant, bell peppers and mushrooms, drizzled with a light Italian vinaigrette. Domestic ham, roast beef, turkey breast, American and Swiss cheese, bread-and-butter pickles and black olives. Pastrami, corned beef, turkey breast, roast beef, kosher-style pickles and olives. Green leaf lettuce, sliced tomato, sliced red onion and dill pickle chips. Mayonnaise and mustard are provided. Breads, assorted rolls, and deli salads can be ordered separately. All platters come in 3 sizes. Court of appeals for the https://essayclick.net/ 9th circuit ruled 2-1 that the practice of reciting the pledge in public schools runs afoul of the first amendment.